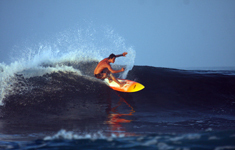 Even on a budget you can have the fabulous Playa Hermosa, Costa Rica surf vacation you have always dreamed of taking. Bring your board and your baggies, great surf awaits you directly in front of the premium accommodations in Playa Hermosa, Hermosa Beach Bungalows. *Holidays can include but are not limited to Christmas, New Years, and Semana Santa. Actual dates vary each year. Ask about upgrading to front row. $250 for 5 night packages and $350 for 7 night packages.